Host an Event | Make Mine Chocolate! Host a Make Mine Chocolate! event! Many of our partners host Make Mine Chocolate! events. These events can be quite simple and tailored to a variety of locations. Send us a picture and description of your event and we'll post it on the website! Participate in a community event. 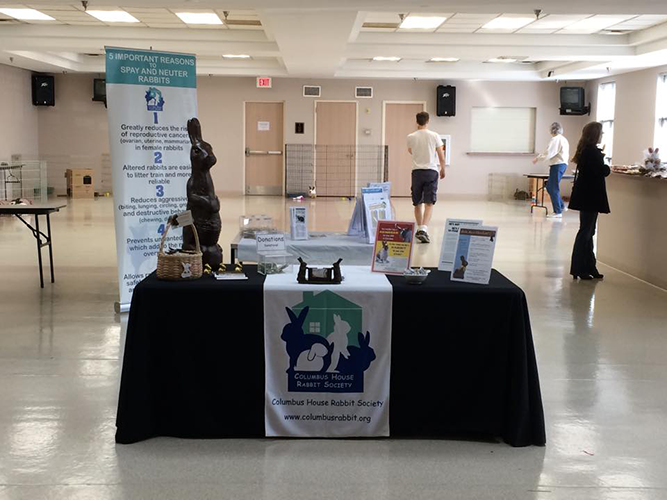 Humane societies are a great place to host an event. 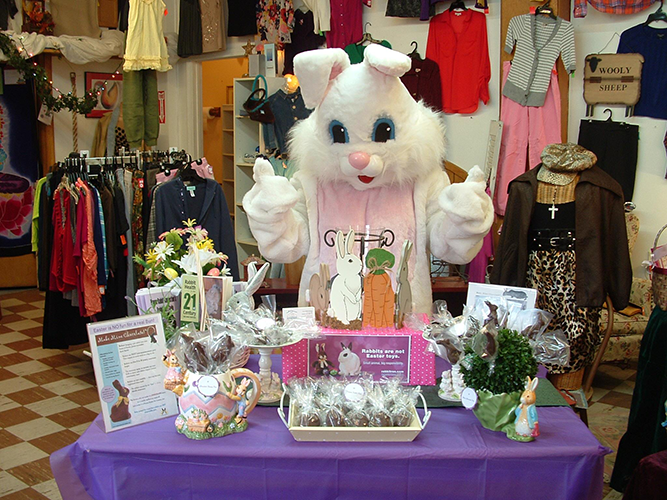 The Columbus House Rabbit Society held a Make Mine Chocolate! 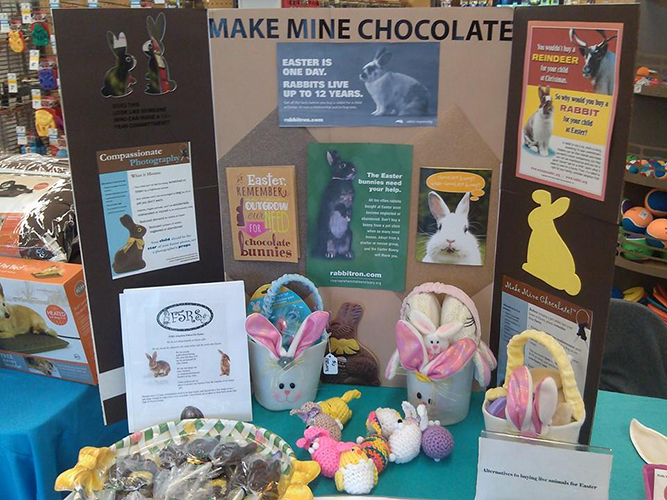 event at Columbus Humane to educate animal lovers about Make Mine Chocolate! Ask your vet if you could hold an event or set up a display. 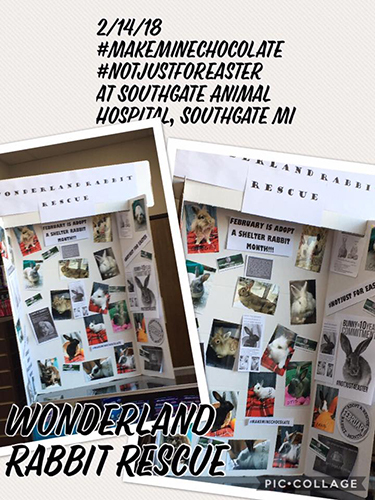 Wonderland Rabbit Rescue set up a small display at a local veterinarian's office. This is a simple but effective way to communicate the Make Mine Chocolate! message to animal lovers. Set up a table at a pet store. Frisky Ferrets, Fuzzies and Feathered Friends Rescue & Sanctuary used this opportunity to introduce pet lovers to the Make Mine Chocolate! campaign as well as educate rabbit owners on proper care. Educational institutions might be receptive to an event or display. 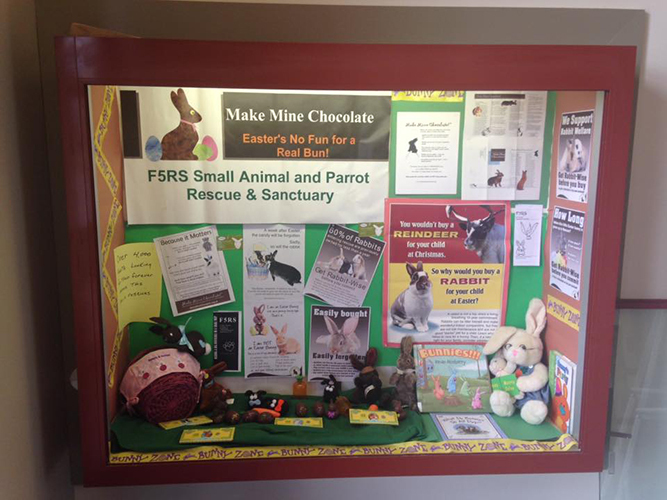 The busy folks at Frisky Ferrets, Fuzzies and Feathered Friends Rescue & Sanctuary combined a library display with a Read Somebunny event for young children. What better way to teach youngsters about rabbits and rabbit care than a well-chosen story. We are so impressed with the creative ways our partners have come up with to convey the Make Mine Chocolate! message. Below are two of our favorites. Hopefully, these ideas will inspire you to create your own displays. 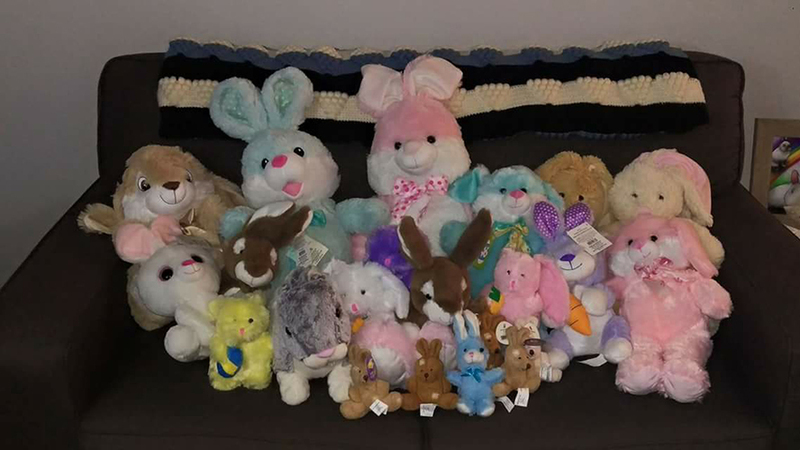 Hoppy Hearts Rabbit Rescue collects plush rabbits and "adopts" them out during the Easter season in place of live rabbits. 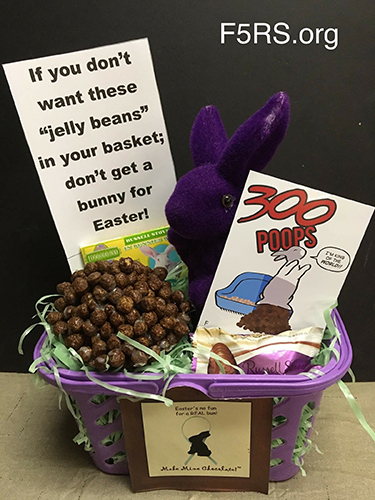 To emphasize the care required by a rabbit, Frisky Ferrets, Fuzzies and Feathered Friends Rescue & Sanctuary used cocoa puffs to symbolize the large quantities of poop a healthy rabbit can produce in a single day.